If you've ever had Jamaican spice cookies, you'll know what this is all about. 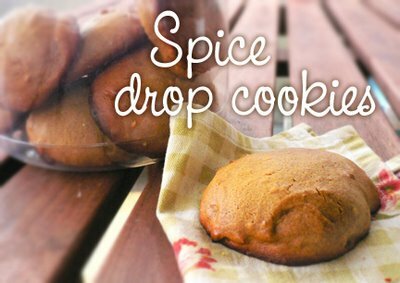 Soft, round, raised cookies with not much in them but some sweet spices and a touch of molasses. Generally spices are too much for Pittas, but a cookie or two won't kill you -- Vatas and Kaphas, go nuts! Pictured here using chickpea flour and maple syrup. Combine all the dry ingredients in a large bowl. In a smaller bowl, combine all the wet ingredients, then add to the bowl of dry ingredients. Mix well. The batter will be quite wet, but if it's soupy add a touch more flour and if it's stiff add a touch more milk. Spray a cookie sheet with olive oil and drop batter onto it by the heaping tablespoon. Bake at 325 for 12 minutes. They will be a bit puffed and lightly golden on the bottom. Makes about 15 cookies. OPTIONAL: I bet it would taste really nice with the grated rind of 1 orange... give it a try! You really are the queen of cookies!